There is increasing consensus that public financing is required to achieve the financial protection from the costs of using health care that is an essential component of the concept of universal health coverage. However, the other dimension of universal health coverage is access for all to health care services that are both needed and of sufficient quality to be effective (World Health Organisation 2010). Some donors and international agencies, such as the International Finance Corporation, argue that private, formal, for-profit providers should play some role in extending access to quality care (International Finance Corporation 2007). There are initiatives by international agencies, donors, African governments and others to expand the for-profit private sector in Africa. These include efforts to attract new local and international investors, encourage bank loans to private practitioners, and subsidise for-profit health care businesses (Doherty 2011). Can this expansion support the principles of universal health coverage? In low- and middle-income countries, for-profit private providers, especially private hospitals, are often costly and located in more urbanised areas. For-profit services are seldom comprehensive and, while they are often perceived to offer superior and more convenient care, there is minimal public monitoring of their quality (Doherty 2015). There is also evidence that private care is subject to incentives that distort treatment decisions (Berer 2011, Ravindran and de Pinho 2005, Hanson, Gilson et al. 2008, Doherty and McIntyre 2013). The existence of private facilities contributes to the brain drain from the public sector and aggravates the fragmentation of the health system. Further, fair competition is obstructed through unfair practices (such as collusion) as well as unregulated practices such as the ownership by single companies of health insurance companies, health care providers and pharmacies (which makes patients vulnerable to exploitation) (Shamu et al. 2010). Lastly, powerful private sector alliances compromise governments’ ability to regulate the sector in the interests of national health objectives. This is not to argue against the fact that some for-profit private providers make very particular contributions to the health systems in which they are located. Some patients prefer some forms of private provision, so private provision should remain an option to complement strengthened public services (Balabanova, McKee et al. 2011). However, in most health systems in developing countries, the private sector is poorly regulated and monitored. Therefore, the perceived benefits of private provision are often offset by the distortions that are introduced by the private sector overall. In particular, for-profit private provision is simply unaffordable for the vast majority of the populations in developing countries. In the current environment of donors pushing for a strong role for the private sector, policy-makers in Africa (and in other low- and middle-income countries) need to embark on a programme of action to strengthen regulatory frameworks. Such a programme includes policies, legislation and reimbursement mechanisms that incentivize appropriate behaviours by for-profit providers (Hongoro and Kumaranayake 2000, Doherty 2015). Without these actions, investment by donors and funders in the expansion of the private sector will only serve to increase inequality in health care. monitoring and evaluating the impact of the private health sector and its regulation on the health system, including on equitable access, affordability, quality of care and efficiency. The length of this list underlines the extent to which extensive interventions are required to ensure that the for-profit private sector meets, rather than undermines, national health objectives, including equitable universal coverage and access to quality services. It also underlines the current weaknesses of governments in developing countries in exercising oversight of the private sector. Accordingly, extreme caution should be exercised, by both governments and development agencies, with respect to promoting further expansion of private provision or health insurance, until solid strategies such as those proposed above can be put in place. Given the capacity constraints facing governments in Africa and other developing countries, it can be expected that progress on these interventions will be slow. A greater priority than expanding the private sector is surely the strengthening of public sector provision, not only to meet the needs of the majority but also to provide stiffer competition with private providers. Public provision must remain the core function of the public sector. Equally importantly, it is a priority for governments in Africa to strengthen mandatory prepayment for health care, especially through general taxation but also, where appropriate, through earmarked taxes, including payroll-based payments. The leverage provided by this instrument in incentivizing providers to comply with quality controls and contain costs is arguably far greater than through legislation alone. Balabanova D, McKee M, Mills A (eds). 2011. ‘Good health at low cost’ 25 years on: what makes a successful health system? London: London School of Hygiene and Tropical Medicine. Berer M. 2011. Privatisation in health systems in developing countries: what’s in a name? Reprod Health Matters; 19(37): 4-9. Doherty J. 2011. Expansion of the private health sector in East and Southern Africa. EQUINET Discussion Paper 87. Harare: EQUINET. Doherty J, McIntyre D. 2013. Addressing the failings of public health systems: should the private sector be an instrument of choice? In: Surender D, Walker R. Social policy in a developing world. Cheltenham, UK: Edward Elgar: 101-124. Doherty J. 2015. Regulating the for-profit private health sector: lessons from East and Southern Africa. Health Policy and Planning; 30: i93-i102. Hongoro C, Kumaranayake L. 2000. Do they work? Regulating for-profit providers in Zimbabwe. Health Policy and Planning; 15(4): 368-377.
International Finance Corporation. 2007. The business of health in Africa: partnering with the private sector to improve people’s lives. Washington, D.C.: International Finance Corporation, the World Bank Group. Marriott A. 2009. Blind Optimism: Challenging the myths about private health care in poor countries. Briefing Paper 125. Oxfam International. Ravindran T, de Pinho H. 2005. The Right Reforms? Health Sector Reforms and Sexual and Reproductive Health. Johannesburg: Women’s Health Project, School of Public Health, University of the Witwatersrand. Shamu S, Loewenson R, Machemedze R, Mabika A. 2010. Capital flows through medical aid societies in Zimbabwe’s health sector. EQUINET Discussion Paper 82 Serie. Harare: Training and Research Support Centre, SEATINI, Rhodes University, EQUINET. World Health Organisation. 2010. World Health Report. Health systems financing: the path to universal coverage. Geneva: World Health Organisation. A recent dengue outbreak in Delhi has once again revealed the shortcomings of the massively underfunded Indian public health system, alongside the unacceptable and illegal exclusion of poor patients by the city’s private hospitals. This blog steals the excellent analysis by my colleague Oommen Kurian from Oxfam India, recently published in the British Medical Journal, as well as the post-dengue prognosis of well known commentators, Reddy and Murphy. Oommen Kurian’s BMJ blog outlined how the current dengue outbreak in Delhi came to international prominence following the unfortunate incident of a young couple who committed suicide after their son was rejected treatment by many prominent private sector hospitals in Delhi. Treatment was denied despite the government saying on 28 August that patients should not be denied admission to hospital on account of a lack of beds. Responding to such cases, the Government of Delhi has issued show-cause notices to five private hospitals asking them to explain why they refused to admit the boy and why their registration should not be cancelled. Kurian’s blog focussed primarily on two major problems: the shamefully inaccurate ‘official’ data on incidence and deaths from dengue fever, and inappropriate profiteering by Delhi’s private health sector during the Dengue outbreak. Reddy and Murthy, two prominent commentators, also argue in their post-dengue prognosis that once the media hype and finger pointing of the current dengue fever crisis passes, citizens of India are left with the same long-term problem of a chronically underfunded public health system that causes unreported tragedy on a daily basis. 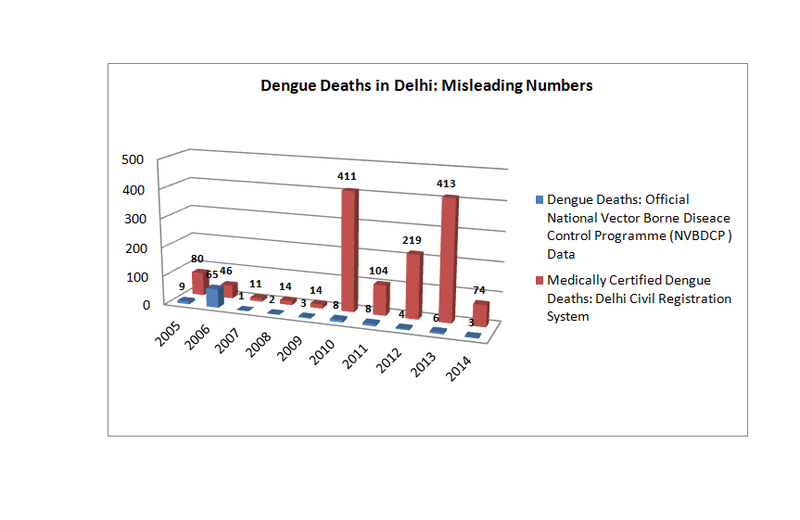 Kurian’s quick comparison of different sources of data on deaths from dengue fever show that only 29 of the 1221 deaths from dengue registered in Delhi between 2010 and 2014 entered the official system (see graph below). Official estimates of the annual incidence of dengue fever nationwide are a staggering 282 times lower than the actual number. Dengue fever affects most of the metropolitan cities and towns in India, where the healthcare delivery systems are better than the rural areas. However, the preparedness of the system against it may be impacted by the level of massive under-reporting of cases and deaths. Delhi has a large number of private hospitals, which have received free land and other subsidies from the government to provide a set percentage of their services free to poor patients. Over time, these charitable hospitals have become purely commercial entities, dishonouring the commitments made to the government. A high level committee assigned by the Government of Delhi, headed by Justice AS Qureshi, took a bleak view of the nature of such hospitals which claim to be charitable just to lap up subsidies and have become “selfish, greedy, and exploitative” moneymaking machines. Data from 2014 show that the average total medical expenditure for treatment per case of hospitalisation is higher in Delhi than any other state in India, at Rs 34,658. The India average is Rs 18,268. Profiteering in times of distress is nothing new to Delhi’s private health sector: even those which claim to be private “charitable” hospitals are notorious. For these very reasons, midway through the dengue outbreak, the Union Health Ministry decided to ask the Delhi government to take action against any overcharging by the private hospitals. On 16 September, Delhi’s Directorate of Health Services issued an order against private hospitals and laboratories overcharging, and implemented ceiling prices for dengue testing. Another advisory on the same day allowed the private hospitals and nursing homes to increase their bed strength by up to 20 per cent on a temporary basis for two months. As of 21 September this year, the press has reported that while the death toll has “risen” to 22 this season, the deputy chief minister announced that the health situation is now better and the government is winning the battle against dengue. Activists do not take these numbers seriously. Advocate Ashok Agarwal, a member of a Delhi high court-appointed panel to oversee the implementation of the EWS scheme (beds reserved for patients from “economically weaker sections”) in private hospitals announced on social media that the Delhi Government’s dengue death figures are incorrect and that 23 dengue deaths have happened in one hospital alone. The director of another hospital in Delhi is on record saying that at least seven dengue deaths had taken place in his hospital alone, as of 17 September. A look at civil registration data reveals that dengue strikes Delhi at regular intervals. With more money already put into health, the current Delhi government—only in its first year of rule—may be better placed to fight any dengue outbreak in the future. However, any effort towards containing contagion should begin with having correct numbers—of cases and deaths—and a long term plan to align the private sector in the state with the broader public health goals of society. Once the current media hype has passed…. Public health systems cannot function as a motley crowd of disconnected actors ad libbing their way through an unscripted play in chaotic fashion. The different actors involved require a script, coordination, direction, and need to work as a team. It is time India got its act together to create strong, well-resourced, responsive and responsible health systems. Or else, terrible things will continue to happen to innocent children, expectant mothers, poor tribals, disabled persons — and to your family and ours. We will all be responsible when such terrible wrongs happen. Oommen C. Kurian is research coordinator, Oxfam India. India’s health care delivery system portrays many contradictions. Enthusiastic policy discourse on Universal Health Coverage (UHC) and user charges co-exist. Grand plans for international health tourism focusing on super-specialty hospitals in the cities are made, while health payments push 60 million Indians below the poverty line every year. The overall public expenditure on health is at just over 1% of GDP but more budget cuts and insurance-based financing are being proposed. Oxfam India’s new Working Paper, “Financing Healthcare for All in India: Towards a Common Goal” highlights some of these contradictions and explores the challenges facing India’s health sector. Sengupta (2013) observes that one reason for the unified support of UHC among international agencies was the global rise in catastrophic Out Of Pocket Spending (OOPS) on healthcare. This is in the backdrop of crumbling public health systems, which in turn was a consequence of a prolonged period of neglect of public healthcare and privatisation of health systems, as prescribed by the World Bank reports in 1987 and 1993. Because of the devastating effects of payments during health shocks, OOPS became politically untenable and UHC was seen as a solution. Evidence of adverse effects of user charges was mounting too. In a way, for many international institutions, promotion of UHC meant a reversal of some of their previously held policy positions. In 2014, the World Bank president Jim Yong Kim admitted : “There’s now just overwhelming evidence that those user fees actually worsened health outcomes. There’s no question about it. So did the bank get it wrong before? Yeah. I think the bank was ideological”. Unfortunately, this new consensus has not yet shown much policy impact in India. The Indian public healthcare delivery system still has user charges, and exemptions for low-income groups are known to be extremely ineffective. The system is also being pushed towards an insurance-based model, which promotes private sector providers. Reportedly, India’s efforts towards UHC is to be based on the experience of Rashtriya Swasthya Bima Yojana (RSBY)– an insurance-based scheme targeting households below the poverty line. This centrally sponsored scheme – which has been in operation for seven years – gives selected poor families (up to five members) an annual coverage of up to $470 worth of secondary level care for an annual fee of less than half a US dollar. RSBY, and several similar regional schemes operating in the last ten years have failed to significantly expand coverage – official data just released indicate that as much as 86% of the rural population and 82% of the urban population are still not covered under any government sponsored insurance scheme. Despite the inconclusive and generally negative evidence on its impact, the high praise given to RSBY and other health insurance schemes by influential agencies including the World Bank and the International Labour Organisation (ILO) has contributed significantly to its policy popularity. An Oxfam paper described such praise as “both premature and dangerously misleading”. Despite the popularity of government- funded insurance schemes at the highest levels of policymaking, there is resistance within the government structures to objectively evaluate the performance and impact of the schemes. Fan and Mahal (2011) observed that politicians and administrators often presume that independent evaluations cause more damage than benefit, and governments in India are known to be hesitant towards conducting independent evaluations of health insurance schemes such as RSBY. It is often claimed that some “rigorous assessment” of its impact is done, but RSBY shares the scheme data “only with a carefully selected group of researchers” – this lack of transparency prevents public scrutiny. Until now there is no disaggregated data available on government’s reimbursement to the health providers through RSBY. Simply put, we do not know how much money is going to the private sector, or how much is flowing back to the public sector. After it was quoted as a successful international UHC case study, and a potential model to expedite India’s UHC, the RSBY data portal stopped uploading even the basic state level data, which was being infrequently updated earlier. The latest data available on the portal is from the first quarter of 2014. The latest evaluation published is from the first quarter of 2013. For many states like Bihar, latest data from many districts are from 2012. The allegation that RSBY is a private sector subsidy scheme still stands, particularly in the light of high prevalence of corruption and the limited or even negative impact that the scheme seems to have on OOP spending. In the light of latest government’ evidence showing that a decade of promoting health insurance schemes across the country has resulted in only about 12% urban and 13% rural population getting covered, there is dire need of a rethink about how India can really achieve UHC. It needs to start with strengthening the public system that India already has rather than reinventing the wheel.